The sun didn´t show up at Workshop this year, but most of the Nano-Network did, which made for a successful conference in terms of quality and networking. Workshop was held at Quality Hotel Edvard Grieg, from 12-14 June. During the conference, we heard 12 talks from PhD and postdoc members of the network and 12 talks from invited speakers from academia and industry. The poster session comprised 16 presentations, mostly from PhD and post doc members. On Tuesday afternoon we went by bus to Lysøen, the villa that was Ole Bull´s summer house while he was living abroad. After our tour there, the buses dropped us off at Bryggen in Bergen city centre where we enjoyed a typical Bergen seafood dinner. The awards for best student presentation and best poster were won by Luca Marchetti, HSN and Dingding Ren, NTNU. 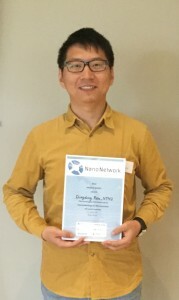 Luca Marchetti won the prize for best oral presentation with ”Design of a bidirectional amplifier for actuation and read-out of resonant sensors based on pseudo floating–gate amplifier”, while Dingding Ren won best poster award with the poster ”Single-mode IR lasing from GaAsSb/GaAs nanowire superlattices”. They both won book gift certificates.